Hello readers! As you can see I’m currently moving my blog over from Blogspot to WordPress. It’s a mess right now but in the meantime you can still access the old blog over at dixiediy.blogspot.com. Hey all, just a quick note about what’s going on over on the blog. I’m having major computer issues lately. So much so that I need a replacement (which I’ve ordered and should soon be shipped). In the mean time – sketchy computer that doesn’t want to turn on means no picture editing, no posting, and worse, no pattern launching. So I’m not MIA but my computer is and iPhone blogging isn’t what it could be. But that does mean that when I’m back in action I’ll have plenty of projects to share! Thanks for sticking around! You’re the best! 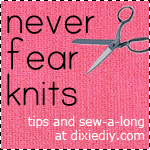 Have you ever had a sewing project where you were way in over your head? I’m in the middle of that right now. To backtrack – I decided to make this year a Handmade Christmas where I make all my presents (or most of them…). That began with this quilt. A monster quilt – in that it features 9 fuzzy monsters and that it is taking up a ridiculous amount of my time. I’ve got to cut out dozens of tiny teeth, eyes, pupils, scales and spots and fuse them to my fleece monster bodies; stuff the monsters’ arms, legs, horns and tails; hand stitch their mouths then attach all the monsters to their coresponding squares on the quilt top. I have been plagued with problems. I can’t find my fiber fill stuffing for the feet. I lost my felt (and then found it again), ran out of embroidery thread and I can’t for the life of me get the paper backing off the double sided fusible webbing. UGH! I know that when it is all said and done it will be an adorable quilt which I will be very proud of, but right now I can’t see the light at the end of the tunnel. So many tiny monster eyeball and teeth pieces! Have you ever been engulfed by a project so large and tedious? Did you give up or plow right through to the end? Do you find yourself often getting into projects like this? Do you ever underestimate the amount of work involved (which seems to be my problem)? Well, I’ll be back tomorrow with a finished project of a different sort – as for tonight I’ll be stitching monster mouths until my thumbs fall off. Sarah from Emmyloubeedoo wrote a guest post on A Couple of Craft Addicts showing how to alter my free Loose Fit Top pattern (with lots of pictures!). She made a longer, hankercheif hem and slighty longer sleeves – a perfect way to transition the pattern from summer to early fall. Thanks Sarah! Go see how to make your own version! ***PS: I’m back from Boston and I’m sewing up a storm. Being away from my sewing machine for so long makes me antsy. Off to the craft room!